Hey BlvdAve, let's jump right in. In case you missed it, this is how Game 4 went down. Game 4 pitted the Dallas Mavericks with their theorhetical backs against the wall vs the Miami Heat in the American Airlines Center in Dallas, TX. The buildup is neccessary primarily because typically a team down 2-1 with two games left to play at home wouldn't neccessarily mean it's a "back against the wall" type of scenario. But for Dirk Nowitzki and the rest of the Mavs, it couldn't quite get any worse. The Mavs star power forward registered a temperature of 102 degrees Fahrenheit, epically pushed forward in attempts to bring his team one game closer the coveted Larry O'Brien trophy. With the story lines circulating around 6th man Jason Terry's 4th quarter performance in Game 3, the rest of the Dallas Mavericks' seemed to be able to help out teammate Dirk Nowitzki when he needed them the most. In another defensive battle, the Dallas Mavericks pulled together to even the series with the Miami Heat 2-2. 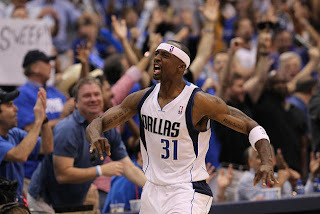 Jason Terry started the 4th quarter with consecutive baskets, giving the Mavericks and an ailing Dirk the inevitable edge they needed to pull out one more, giving them great momentum heading into Game 5. Despite Dwayne Wade having one of his best performances of his playoff career, the Miami Heat could not close out, once again, when it mattered most down the stretch. Udonis Haslem and Chris Bosh both played with their recent usual playoff consistency, scoring 24 and 4, respectively. Udonis Haslem's productiction was not neccessarily on the box score, but as his hustle and aggressiveness under the basket, freeing up Chris Bosh on multiple occasions to hit open shots and break to the basket. LeBron James played more minutes than anyone on both teams, logging 46 totals minutes of floor time. And came out of the game with a mere 8 points on 3-11 shooting, 0-3 from 3pt and 2-4 from the line. LeBron created a riddle that no one can seem to figure out in Game 4. He has all the talent in the world, but seemed powerless. He has all the athleticism on the planet, but appeared grounded. His indifference and ineffectiveness in Game 4 was jarring, and the amazing part is the Heat almost survived it. Something the Dallas Mavericks can't be too happy about. "You don't want to give them two chances to close it out at home, so this is our Game 7 and the last home game for this year in this building," said Dirk Nowitzki. "It should be a great atmosphere and hopefully we can pull it out." And Dirk also understands the type of pressure Dallas now has with LeBron looking to obviously play a lot more aggressively. "I expect them to attack like they did in Game 3 where [Dwyane] Wade and LeBron got to the rim a bunch of times early," Nowitzki said. "We've got to be ready defensively. That's where we really made a mistake defensively in Game 3. We weren't ready to play on the defensive end and that's what really got us in trouble." Rick Carlisle says the pressure is just a part of the job description. "We love pressure," Carlisle said, "and the more the pressure's on, the better our team has functioned all year long. So bring it on." So with Game 4 a mere memory and a tie-breaker on the horizon, let's take a look at some of the keys to tonight's match-up. Lebron James scored 8 points in 46 minutes of play, his worst offensive playoff game of his career and probably life. I expect that not to be the case in Game 5. 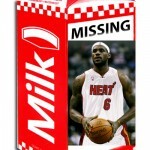 Despite LeBron's poor offensive performance the Miami Heat still only lost by two. This is something positive for the Heat looking forward going into tonight's game. As long as LeBron improves slightly from his perfromance in Game 4, the Heat should have a strong chance of heading back to Miami looking to close out this headache of a series against the once thought soft, one-dimensional Dallas Mavericks. But if LeBron continues to fade in the bright lights of crunch time, then not only Dwayne Wade who seemed to jar at Wade to motivate aggressiveness late in Game 4, and Pat Riley & Co. will be undoubtedly scratching their heads at how the best player on the planet can dissipate on basketball's biggest stage. 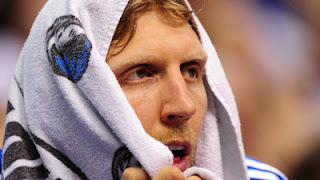 Dirk Nowitzki battled a 102 degree temperature to lead the Dallas Mavericks to a Game 4 win, but is it any better. To anyone who has ever experienced a fever or flu knows first hand the weakness that the virus can take hold of the body. So when Micheal Jordan bombed 38 points against the Knicks, it was to be noted that he was playing against 6 defenders. The same goes for Dirk. More interesting in this matter is whether or not the other players in the series get exposed to Dirk's virus. The Mav's inevitably played with biological warfare as they Dirk out to compete with such a critical sickness, exposing germs to not only the opponent but his own teammates. Watch closely tonight as alot of players might be blowing their nose, or playing significantly less effective. So tune in tonight at 8pm ET as the Dallas Mavericks look to wind out their home stand against the Miami Heat and have two opportunities to try and close out the series down in South Beach. And look for No. 6 from the Miami Heat on the court. I heard he's pretty good.